This is a very cool color with a lot of shimmer. I had hopes that it was more of a sheen, but…I can definitely work with this. Layering this over warm orange-red mattes will cool them down a bit, and hopefully they'll work with my coloring when they've been lilac-ed a bit. 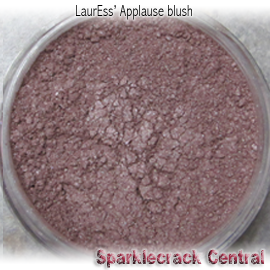 The color is very similar to Meow Cosmetics' Deity glow powder - but Applause is just a tiny bit more pigmented. This is what BE's Heaven blush might look like if it had a higher shimmer factor.